I am one of 12 hand selected artists to customize the 8 inch "Tuttz" resin sculpted and cast by Argonaut Resins founder Eric Nocella Diaz. I decided to go with a King Tutankhamun sarcophagus theme. The head is done after the mummy mask of Tutankhamun. Below on the breast is a winged scarab pectoral representing the god Khepri, the rising sun, pushing the sun disc above the horizon. The left side contains the white vulture image of Nekhbet, the right the image of Uraeus is a symbol for the goddess Wadjet, who was one of the earliest Egyptian deities and who often was depicted as a cobra. Combined they are know in Ancient Egyptian texts as, Two Ladies, the deities who were the patrons of the Ancient Egyptians and worshiped by all after the unification of its two parts, Lower Egypt, and Upper Egypt. The tail is painted as the crook from the burial coffin. These sleek beauties have been flying off the shelves through the online store. 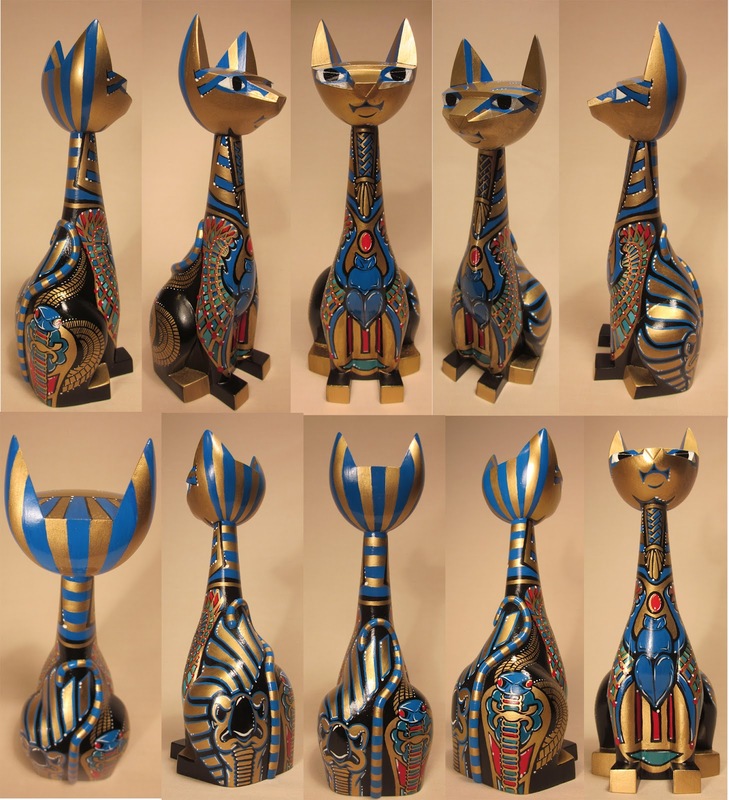 I am humbled to be part of a such a talented cast of artists customizing these cool cats. Best custom Tuttz ever! 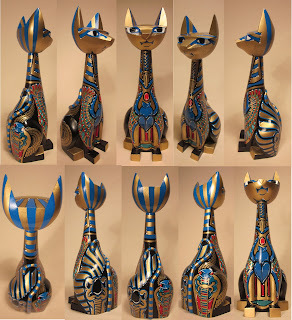 Great integration of ancient Egyptian iconography into the Tuttz design. Makes me jealous just to have plain ol' Tuttz.